Handle Supplies: Door handles and door locks from Cork for Ireland and beyond. Door handles and door locks from Cork for Ireland and beyond. 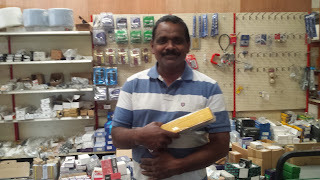 EM Hardware Supplies Ltd is trading in specialist door hardware for the last 35 years. Although the company was there long before the internet became a part of everyday life; one would think that the vision in setting it up required fore knowledge of the upcoming power of the web in order for the business to achieve it's full potential. In recent years the web friendly name 'Handle Supplies' has been registered as a trading name and also purchased as a domain name to keep the online and offline trading identity consistent. handlesupplies.ie , handlesupplies.com and hardwaresupplies.ie are also now domain names used by the company. Owned and operated for the last 14 years by husband and wife team John and Brenda O'Driscoll, a vast range of door handles, locks and related hardware items are supplied to retail and trade customers locally, throughout Ireland and beyond. Selling in answer to web inquiries, e-mailing, texting and viber messages are as much a part of doing business as meeting and selling to walk-in customers. Because the market for many of the door locks and handles in Ireland is not of a sufficient size to justify stocking everything, many our of customers have come to know that nearly anything can be quickly and efficiently supplied to order. It is a good sign of the improving Irish economy to see an increasing demand for kitchen handles and doors handles from local and nationwide customers, who are now doing-up their houses in increasing numbers. All tastes are catered for in door handles and related hardware fittings, from the most modern to ageless classical designs. To help keep up our product knowledge we reqularly attend the largest trade fairs in the world. We have an envious list of more then 60 quality suppliers to help us supply everybody. The picture above shows one of our customers from India on his second visit to our store. Handles purchased in our store at Cobh Cross Industrial Estate outside Carrigtwohill were later fitted in his house in India. Customers from the UK, South Africa, Australia and America have also bought from us. We look forward to greeting more local and global customers and to supplying all with the best quality door handles and related hardware fittings and at the best prices . Call 021 488 3131, email handlesupplies@gmail.com or just walk in and find a range beyond anything you thought was possible.